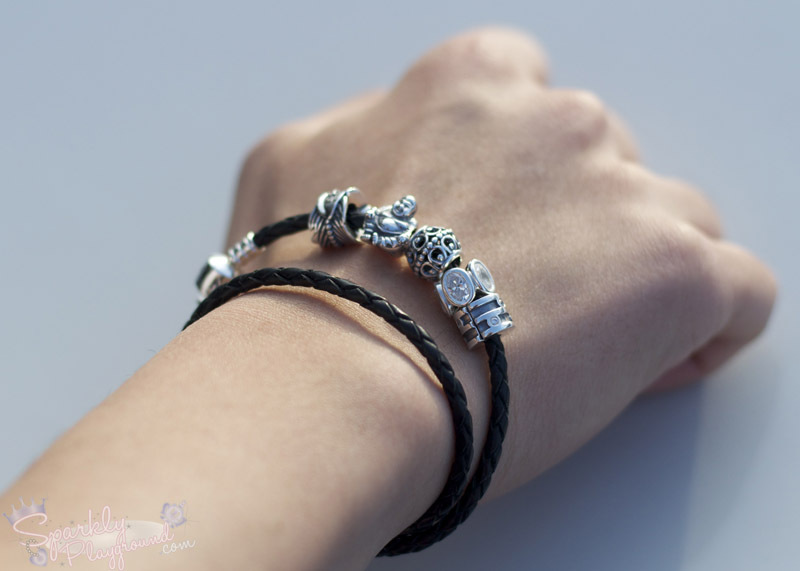 Following my pervious post, here comes my experience at creating my first Pandora bracelet! Woohoo!! Keshia and Michaela of Pandora were at the booth to help out with our creation of bracelets. I was helped by Michaela and here's my journey to wrist candy!! Keshia is the helping Desiree while I keep my eyes out for any pink and sparkly charms. I told Michaela that I'm clueless about the whole charms thing. I made charms bracelets before but not quite the same so she advised that I pick out the bracelet I want first. There were a few to choose from, leather, fabric, silver and gold. 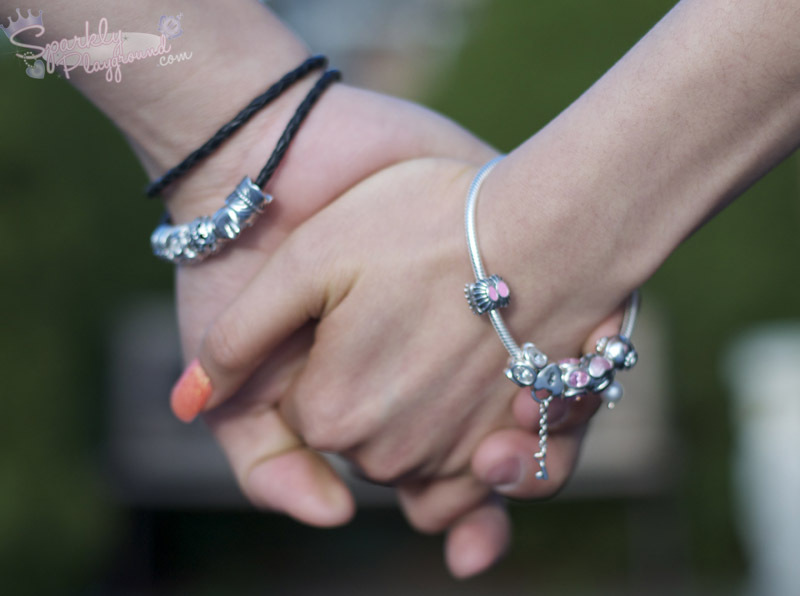 See full collection of bracelets here. 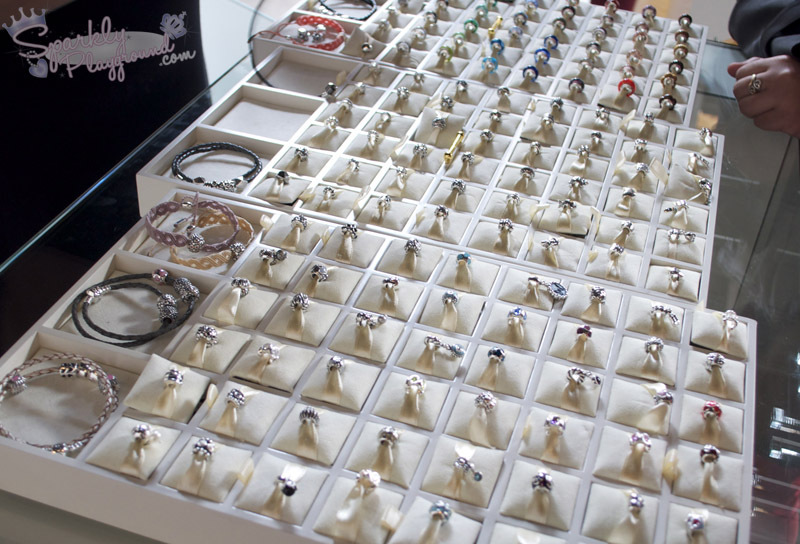 I knew I wanted a sterling silver right away because I think it will be very easy to match my outfits and will look good against my skin tone. Here, Michaela fits the bracelet on me to make sure the size fits my wrist. 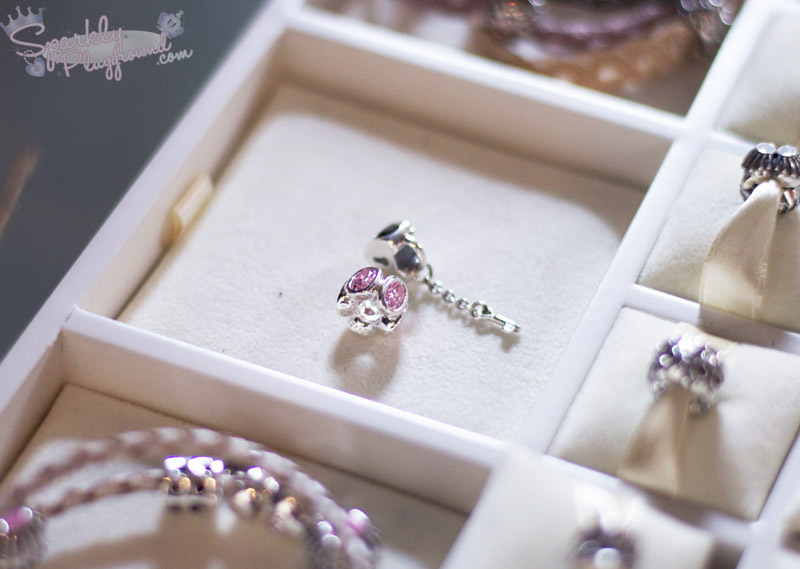 Her tip to choosing the right size is to make sure you can fit two fingers in between because as you fill it up with charms, you're going to need some room for the charms to move around. I love pink and bling!!! 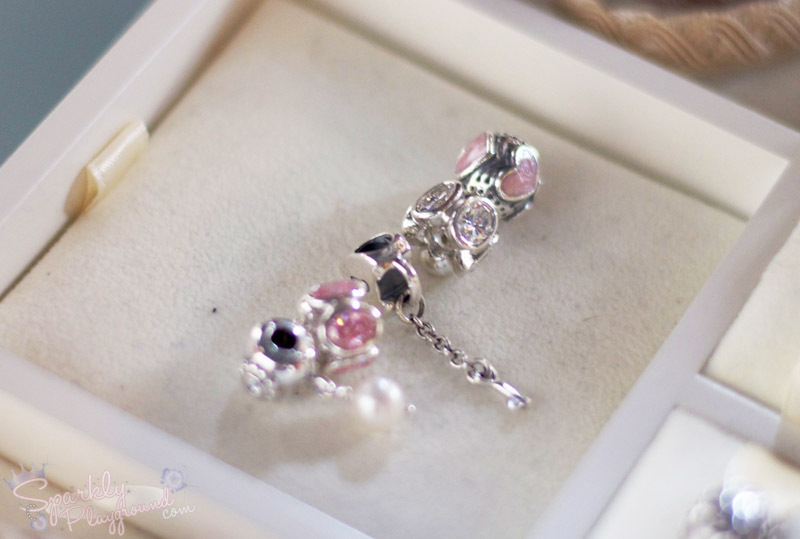 Literally the first thing that caught my eyes was this pink crystal charm. The next thing I asked was "Is there anything dangly?" I was searching and I actually found it! There are other dangly charms like music notes but nothing is cuter than this one in my eyes! I LOVE IT!! 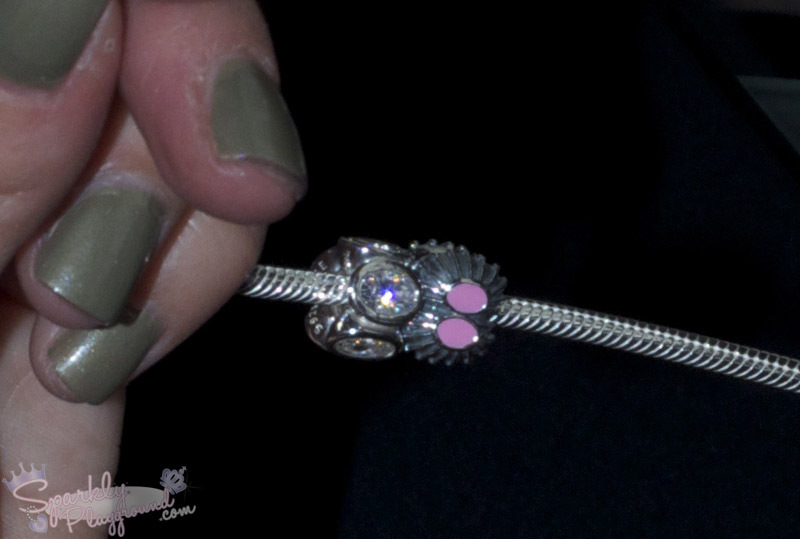 I like how she places the charms side by side so I can see how the charms match together as I make my bracelet. I guess it took me a while, there were too many charms to choose from! 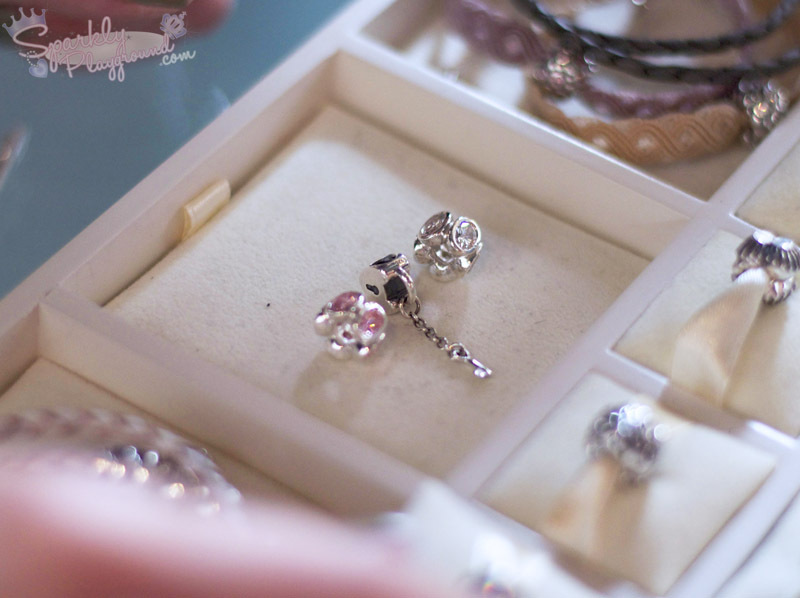 I finally spotted another bling bling charm :):) yay! And then, I spotted another hearty charm! It seems to look better real life than in photos! Finally, I chose my other "Clip" charm to keep all my charms in place. So now, I have two Clips on each end. 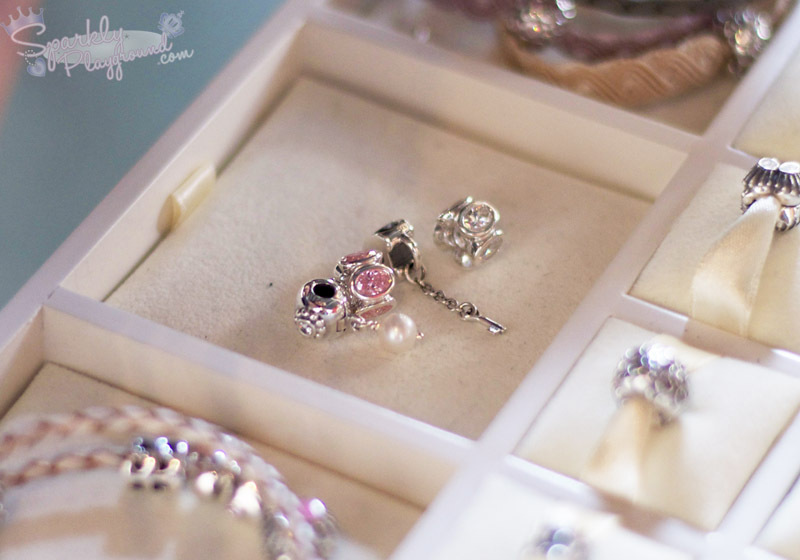 I think clips are probably optional when you start collecting lots of charms on your bracelet. AND TA-DA!! I'm so in love with my bracelet right now. It's still pretty empty but I'm already looking forward to filling it up! :) ps, the bracelet right now hurts my wrist because it keeps pulling my arm hair (LOL) so I better fill it up soon! hahaha!